So much hype about this great man. But that is just the problem, he is so hyped up people forget what he stood for. It’s like his name, image and identity have been stolen and used to de-contextualize who he was. First and foremost he was a proud, respectable, humble man of Mexican descent who came from a farm worker family. 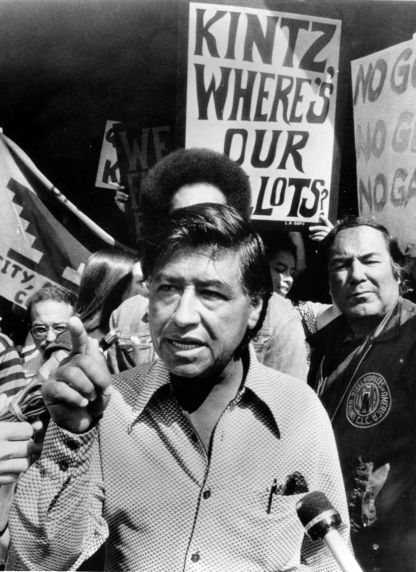 As he grew up he became an organizer and eventually the leader of the United Farm Workers Union in the United States. Along with the union and those that supported his cause he was fighting for better working conditions for farm workers. He was fighting to get better pay and benefits for one of the most exploited sectors of the working class in the U.S. He believed in non-violence as a tactic in his organizing, but I believe this is where he gets lumped in with Martin Luther King Jr. and Ghandi, who also believed in non-violence. The problem is not the fact that he believed in non-violence, but that it is over emphasized when discussing these three great leaders. All three of these leaders represented a threat to the ruling class. Ghandi to the British Colonialism that oppressed India. MLK to the racist segregation of the U.S. and Chavez to the growers and other capitalist that sought to maximize profits while exploiting mexican, filipino and other farm workers. So remember on this day honoring Chavez, he first and foremost sought better working conditions and pay for those breaking their backs in the fields of California and beyond. He and the UFW stood as a threat to the growers that sought to do one thing and that was to maximize profit. Seek the truth and you shall find it. Bring back what Chavez really stood for, human rights and dignity for the working class..! !